Dense fog blankets the harbor this morning. We hop the public transit system and ride to Bar Harbor to see the sights. 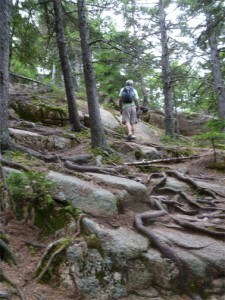 There is more of everything in Bar Harbor. More people, more traffic, more restaurants, more whale watcher tours and more t shirt shops. And jewelry shops. And pet supply shops. And kitchen gadget shops. Presumably, market researchers have determined that tourists are likely to make impulsive purchases of t shirts, jewelry and a toy for Fido, moreso than any other objects that they don’t need. Mt. Desert Island offers a highly efficient public transit system. One can ride a modern bus fueled by compressed natural gas to just about any destination on the island at no cost. This service is made possible by major financial support from LL Bean. Neat corporate marketing concept for an outdoor business. The idea is to encourage visitors to leave their cars at their hotels, thereby reducing emissions and traffic congestion on the park roads. This system works especially well for visiting yachtsmen that do not have access to private transportation. The bus stop in Northeast Harbor is conveniently located near the dinghy dock. There is service every 30 minutes between 10 AM and 8 PM. From Bar Harbor, we ride the bus to Bubble Pond, where we access a hiking trail to Pemetic Mountain (1248 feet). The ascent is rocky and steep. When we arrive at the summit, the fog is thick, the wind is howling and visibility is minimal. 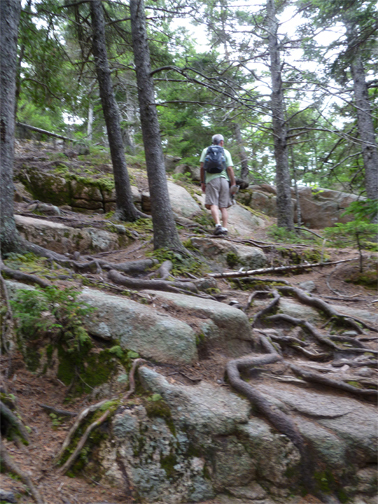 Our descent follows an alternate trail south to Jordan Pond House. 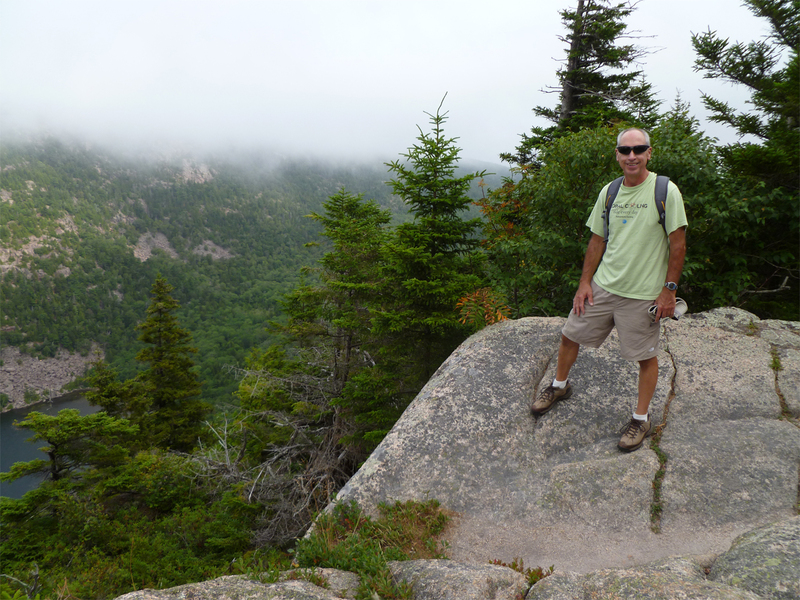 During this three hour hike, we encounter a total of five other hikers along the trails. We enjoy the solitude of our outdoor experience, if only for a brief period of time. 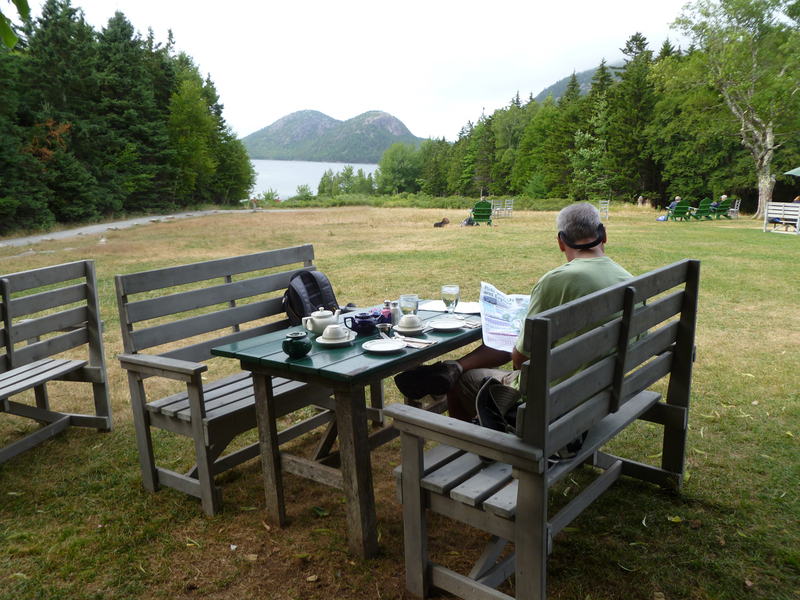 We reward our accomplishment with a pot of tea on the lawn at Jordan Pond House. The cloud layer is thickening, the wind is intensifying and the temperature is falling. Rain is in the forecast for this evening. We take the free bus from Jordan Pond to Northeast Harbor, pleased that the rain has held off just long enough for our dinghy ride back to Cutter Loose.